His brand behaviour has been is based around collaboration. Hardly anyone listens to UK hip hop, but Dizzee has taken himself out of that niche through successful partnerships with everyone from Arctic Monkeys to Calvin Harris. Far from diluting his influence, its served only to increase it, and that of the niche genre from whence he came. And what he's doing is NOT piggybacking. He's talked in the past about collaborating with Kate Bush - which would be doing her a favour PR-wise, but would also further strengthen Dizzee's "Rep". That's because collaboration always works (well, a collaborative attitude will always pay off in the end). So many brands are too precious to be seen next to other brands, and miss awesome opportunities as a result. Mutual backscratching is basically proven as a very efficient and effective way to do business. More fundamentally than that, Dizzee's collaborative attitude shows a depth of understanding of his target market. These are kids who've grown up plugged into a 'net where mashups are the norm, where the barriers to social interaction are so low that you "might as well give it a go" every time. Collaboration is just a bigger part of life now. Its only right that this change in attitude is reflected by brands. So, if Noel Gallagher's recent un-endorsement of Jay Z's Glastonbury appearance is symptomatic of his attitude to collaboration, I think we can safely assume we won't be hearing from Oasis anytime soon. Don't worry, I'm not getting all street on yo asses here. Dizzee's brand talks in a way that is exactly how the product is. Granted, its easier because he's a one man brand - but think about how many interviews you've read where celebs/artists talk like they're been briefed two minutes previously by a PR guy (wonder why?). LP: What requests do you make at a festival? Dizzee: I'm really low maintenance. But it pisses me off when people can't get the simple things right, like honey and lemon so I don't lose my voice. LP: How do they manage to get that wrong? LP: Have you lost your rag? Dizzee: I've had to! It's not like I asked for some unicorn midgets! The man is a genius. ...was that at all convincing? Thought not. 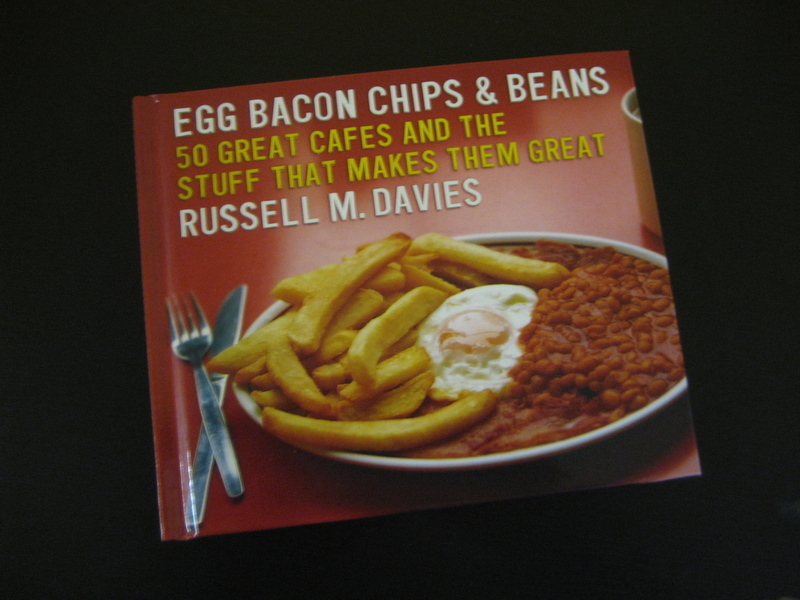 For those of you who aren't readers of Russell's blog (Hi Mum) he has been trying to work out how the hell Amazon's ranking system works for his fantastic book "Egg, Bacon, Chips & Beans" - a guide to the best fry-up dispensers in the bits of Britain where Russell goes a lot. In the process, he asked if anyone wanted to buy a copy from him so he could do a bulk order from Amazon and watch the ranking go ballistic. (That didn't happen, so he's still none the wiser.) To make it more interesting, he allowed anyone who ordered one to request a dedication. I couldn't resist the opportunity to be silly, hence Russell's fake request for a job. To be honest, I didn't think he'd go for it - but am very pleased he proved me wrong, and chucked in some nice little badges too. Thanks Russell. Here at Nonsense, we've just completed our latest bit of work. It's for ActionAid UK, and our brief was to get more people to take the "Who pays? pledge", stating that they want to see tougher regulation of how UK supermarkets treats suppliers in developing countries. So that, in a few weeks, ActionAid can present a big list of names to the Competition Commission (who are set to report on UK supermarkets soon). I'm gonna resist the urge to bash the likes of Tescos, Sainsbury's etc on this blog. (Largely because ActionAid do a much better job of that than I ever could here.) Nor will go off on one about how good a cause it is... that should be obvious. This has the obvious benefit of getting people more involved in the Who pays? movement from the start. And, the thing I really like is how it works as a "distributed widget-y campaign thing" - i.e. members of the public are going out and getting sign ups for us, by embedding it their blogs like I have, or using the clever tools to send it to all their Facebook friends. It's something I've noticed a few people have been thinking about since Iain Tait posted on his blog about how difficult it is to get good stuff out there these days. As well as the techie stuff, our friends at Fuse also did the animation work, which I'm sure you'll agree looks beautiful (nice one B-Man!). When I get time I'll post about being open about collaboration (I've got a bit of a bee in my bonnet about the 'White Label' culture - which strikes me as largely unnecessary). Anyway, please-please-please-please can you all watch my campaign, sign up, and then make your own and get it out there? Cheers! We have lots of meetings. Most of them go on too long, I think because we're all people who get childishly excited about an idea, so it only takes one or two of us to "go off on one" and that's 1/2 an hour down the toilet. This is annoying. (Unless I'm the one who's off on one, then I don't notice it.) So, we're going to try some things to keep meetings short, sweet and efficient. First thing - Upright Meetings. i.e. standing up. Good for short meetings, like briefings, and with the fringe benefit of making great use of wall space and blu-tack, rather than table tops. We've done a couple and they work well, especially the bit at the end where you all go off to do your bit - makes you feel a bit like an American Footballer after a huddle. Second thing - Stupid Countdown Clock (above). 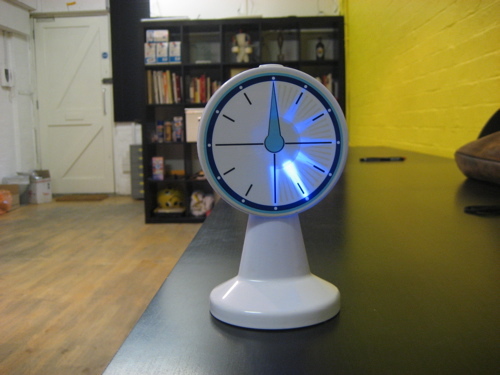 This was £8 from Amazon, and comes complete with flashy blue lights and, critically, the famous sound effect. 30 seconds before the end of a meeting, hit the button on the top, and voila; an added sense of urgency.